For my Advanced Digital Photography class for Community Ed. Winter Term at Portland Community College, we studied and were inspired by the masters of photography of the 20th Century, Starting with Eugéne Atget, Edward Steichen and Alfred Stieglitz, two photographers were presented every week for six weeks, concluding with the use of color by Ernst Haas and Jay Maisel. It was great fun exploring these masters of light and expression. Assignments were given to learn, emulate or be inspired by these historic and important photographers and their various photographic styles in order to inform our own photography. There is also much to be learned from a photograph, both attractive elements and subject, and, just as importantly, what you may not find interesting, to help further refine your personal photographic perceptions and preferences. The majority of class time was devoted to reviewing student’s photographs, adding comments make suggestions and discuss challenges. Constraints were also required in the assignments to get a feel for what it was like before the days of auto exposure and auto focus. 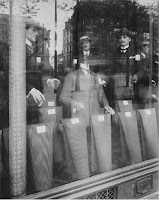 Street photography can be also be rather challenging, but everyone rose to the task. We had a number of interesting field trips. We gathered in downtown Portland and photographed in Old Town (near where Minor White photographed) and also along the Steel Bridge. 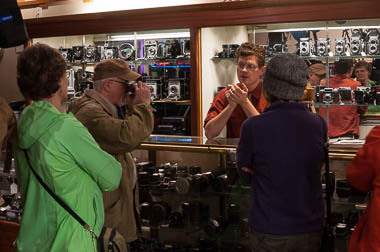 Another evening we visited Blue Moon Camera and Machine in St. John’s, given by Zeb Andrews, to examine and view through period film cameras. 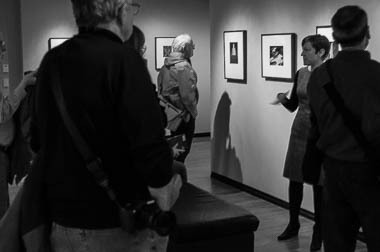 We also had a private lecture/tour at the Portland Art Museum graciously given by Dr. Julia Dolan, Minor White Curator of Photography, of the Fotofolio exhibit, which featured many of the photographers we discussed, with portfolios from Ansel Adams, Edward and Brett Weston, Paul Strand and a series from Minor White on display.